House GOP's Leaders Set; Democrats' Not : It's All Politics The House GOP's new leadership topped by John Boehner, is clear as Democrats play musical chairs. Besides Boehner, the House GOP has Cantor, McCarthy and Hensarling, The Democrats have Nancy Pelosi as the likely leader and a fight for the rest. Eleven days after the election which shifted control of the U.S. House of Representatives to the Republicans after their four years out of power, we know what the GOP leadership team looks like. Rep. John Boehner of Ohio, 60, is the presumptive next Speaker, a constitutional officer second in line in presidential succession. Rep. Eric Cantor of Virginia, 47, is set to be the majority leader. He has had the distinction of being the only Jewish Republican in Congress. 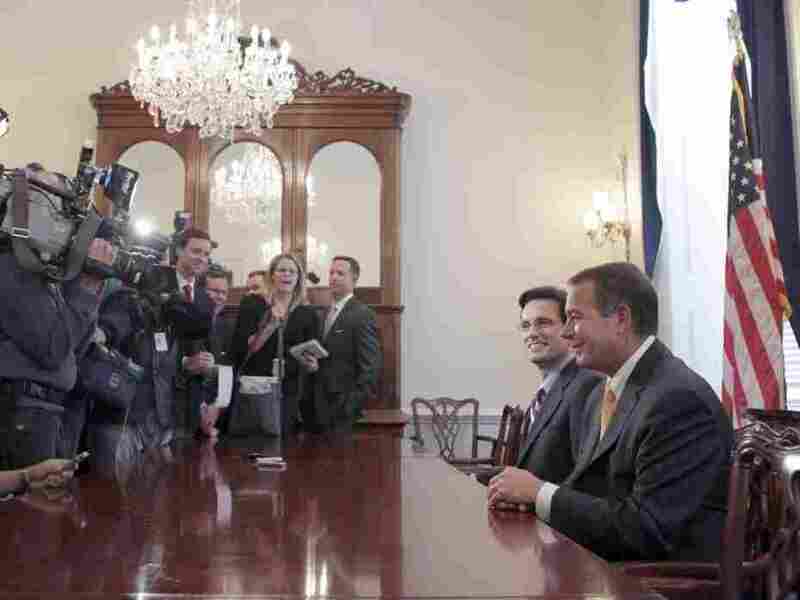 Rep. Kevin McCarthy, 45, of California is ready to become the majority whip, the chief vote counter aka arm twister. McCarthy is credited with recruiting a number of the successful Republican candidates. The fourth position in House majority leadership, the House Republican Conference Chair is expected to be filled by Rep. Jeb Hensarling, 53, of Texas. Rep. Michele Bachmann of Minnesota, the high-profile founder of the House's Tea Party Caucus, decided not to contest Hensarling for the post. The House Republicans have definitely chosen to go with relative youth compared to their Democratic counterparts whose top leaders are over the traditional 65 year old retirement age. In the majority, the Democrats have had four top leadership positions but in the new Congress they'll just have three. Speaker Nancy Pelosi, 70, is expected to be the minority leader post since she has no opposition. But there's a contest between two members of the current leadership for the minority whip position. Rep. Steny Hoyer, 71, of Maryland wants the position but is competing for it with another septuagenarian, Rep. Jim Clyburn, 70, of South Carolina. Clyburn has been the most powerful African American in Congress, holding the third position in the minority. With blacks being such a significant part of the Democratic base, that gives Clyburn some leverage. But Hoyer comes from Maryland with its significant African American population. Indeed, that fact is stressing some African American members of the House Democratic Caucus who now must choose between an a member of their delegation of a felllow member of the Congressional Black Caucus. Whoever doesn't get the whip post could go for the House Democratic Caucus Chairman position, which Rep. John Larson, 62, of Connecticut would like to hold on to.